Stephen W. Terrell's (MUSIC) Web Log: WACKY WEDNESDAY: You Think I'm Psycho, Don't You, Mama? WACKY WEDNESDAY: You Think I'm Psycho, Don't You, Mama? Leon Payne, the blind bard of Alba, Texas, is best known for writing the Hank Williams hit "Lost Highway." Personally, I think he should be remembered more for "Take Me" by George Jones or "Selfishness of Man," a gut-puncher recorded by Jones, Bobby Osborne, Buddy and Julie Miller and others. But neither of those are the Leon Payne song I want to talk about today. I want to talk about one that has always seemed to be somewhat out of character for Leon. I first hear this tune at Cafe Oasis in the early '90s, the first time I saw ex-Angry Samoan Gregg Turner play. It's a perfect song for Turner, a pretty tune full of black humor and strange plot twists. I assumed he'd written it. But he told me it was the work of "some old country guy" and that Elvis Costello had recorded it. And many others followed. 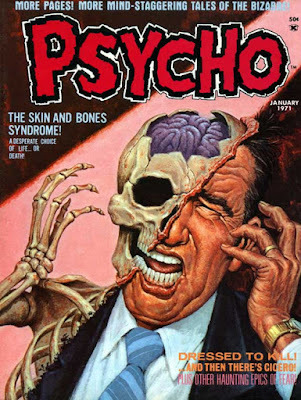 As Randy Fox wrote in Nashville Scene in 2012, "Psycho" became "a favorite cover song for many alt-country bands that skew to the weirder and darker side of country. Thus proving a great country song will always find its audience, once the world gets weird enough." In his "Psycho" article Fox interviewed Payne's daughter Myrtie Le Payne, who told how her dad came up with this macabre song. "Jackie White was my daddy's steel guitar player," [ Myrtie Le] says. "He started working with him in 1968, and the song came out of a conversation they had one day." Fox wrote, "According to the story related by White, in the spring of 1968, he and Leon Payne were discussing the Richard Speck murders. Speck murdered eight student nurses in Chicago in July 1966 and was convicted and sentenced to death the following year. Being a history buff, Payne was familiar with the cases of many notorious mass killers, and the discussion soon turned to other famous cases — Charles Whitman, Ed Gein, Mary Bell and Albert Fish. That conversation directly inspired the song." According to this, the opening line, "Can Mary fry some fish, Mama?" is a sly reference to Mary Bell, a child killer who was a child herself. Her life story makes me wonder whether she's the inspiration for Nick Cave's "The Curse of Milhaven." And here are more, including covers by Jack Kittel, T. Tex Edwards, Andre William & The Sadies, and more. Sorry, I couldn't find a Gregg Turner version anywhere.